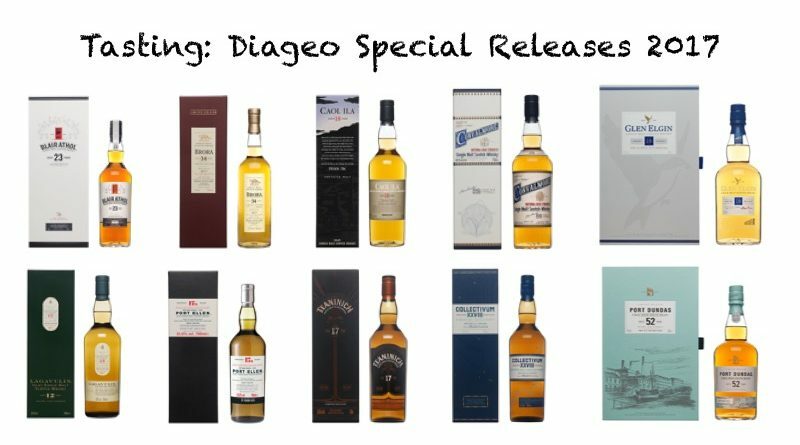 Bei den Special Releases wählt Diageo jedes Jahr einige Highlights aus. 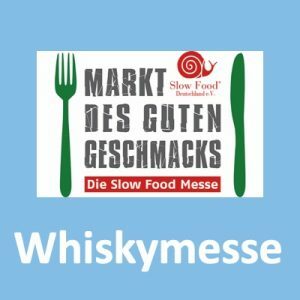 Zehn Stück sind es auch 2017 wieder gewesen. 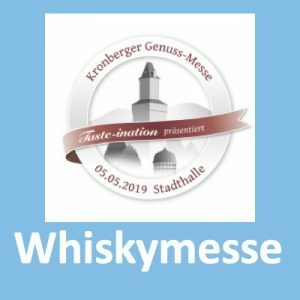 Meist sind Caol Ila und Lagavulin dabei, Port Ellen und dann viele andere spannende Abfüllungen. 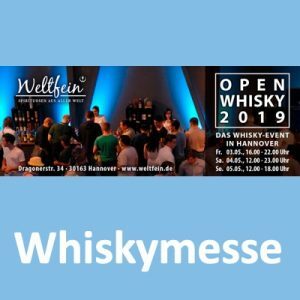 28 Destillerien hat Diageo und da kommt auch die Besonderheit ins Spiel: der Collectivum ist ein Blended Malt aus allen 28 Single Malts. 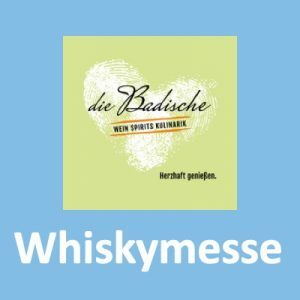 Auch 2017 habe ich es nicht auf die Vorstellung während der BCB nach Berlin geschafft. 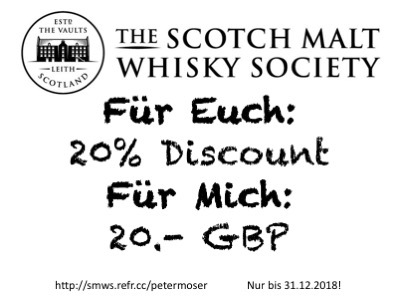 Aber auch dieses Mal war Thomas Plaue, Master of Malt bei Diageo, so freundlich, mir Proben zur Verfügung zu stellen. 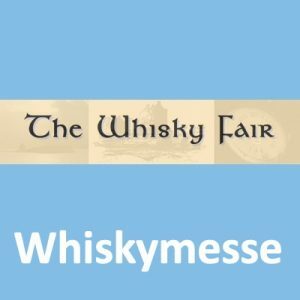 Der Port Dundas (Single Grain) war schon vergriffen, aber die anderen neun werde ich mir jetzt in Ruhe vornehmen. Ich bin gespannt. Stay tuned! Nose: At first vinous, and drying. Soon, peanut brittle and honey leap out; intensely sweet with a savoury backbone. Hints of toffee and caramel continue, with brûlée topping and baked bananas. Next a complex layer of herb and spice; tarragon and mint with warming spice. Opens out into sweet buttermint, accompanied by more nuts as well as savoury leaves and forest floor notes. A little water dries, and introduces a trace of chocolate malt. Palate: Rich, smooth, sweet and warming; fruity too. Much more savoury than the nose, with barrel char, spicy oak and liquorice. Aniseed ball heat and treacle toffee sweetness bring on lighter and sweeter notes of candied lemon zest and spiced cooking apple, before diving back into leafy herbs and warming spice. Water smoothly lifts the sweetness, with bitter-sweet fruit and oak, and sweet pepper. Finish: Sweetly fragrant and spicy, as the sweetness of mint creams and caster sugar fades to leave a herb garden after rain and soft, oaky spice. Fresh mint, with hints of forest floor and charred oak. Nose: At first maritime and mineral, with dried seaweed. Then waxed apples, damp straw, hints of honeysuckle and underlying touches of oily rags suggest a cider farm’s workshop in springtime. Spicier and slightly dusty tones of earth and browning leaves develop in the weightier, savoury centre, which shows fresh-peeled bark, turmeric and mace. There’s barley sugar and a hint of orange juice or tinned pineapple too, with travel sweets and green leaves, all on a faintly waxy base. The latter emerges more with water, as does the floral, herbal fragrance. 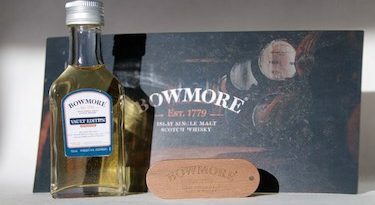 Palate: The taste starts sweet, with only a little of the waxy texture for which Brora is renowned, so at first it’s sharper than you expect, with fruit, chili and fresh-ground black pepper. As the heat subsides, fruity dark chocolate and soft barrel-char smoke appear, with damp oak, apples and aniseed. The heat slowly builds, as does the fruit. Water brings up the waxy texture, with spicy and mouth-cooling Szechuan pepper masked by chocolate, sweet grass and fruit sweets. 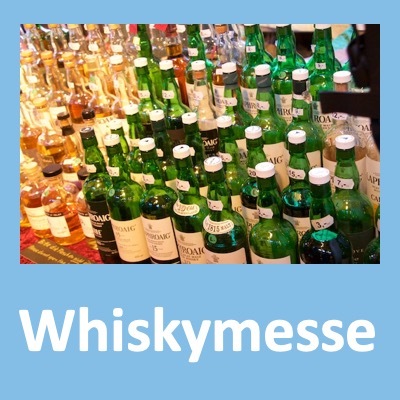 Finish: Some spice in the finish, as earthy chocolate, barley sugar and aniseed slowly fade to leave sweet-spicy oak, tart apple and chocolate-covered delight, with a final quick burst of black pepper and sweet fruit. Nose: Surprisingly weighty, with a meaty backbone that doesn’t rely on the distillery’s usual smoke for depth. Initially sharp and prickly, the first impression is of lemon zest, edging towards lemon drizzle cake and lemon sherbet sweets, or perhaps honeysuckle, vanilla cream and egg custard, along with toffee, green-leaf herbs, fruit gums and soft spiciness. Later, a dry minerality builds in the glass, adding a chalk and flint austerity. The addition of water softens the nose and adds fleeting scents of pine-sap and artist’s studio, against a maritime background. Palate: The taste is sweet (boiled sweets), acidic (bitter lemon) and salty, walking a knife edge between all three. Occasionally it slips into sour orchard and sweet candied fruit, then into intense salted caramel and toffee. Hints of sea-spray dance the edges, along with barrel-char smokiness, oak, black-pepper spiciness and fresh clean notes. Finally, the fruit and char unite in triumph, as fresh-baked apple pies. Water amplifies both fruit and spice, with liquorice and orange zest, the spice gaining heat and a hint of chilli. With water, these primary tastes soften yet remain clear, becoming more rounded and accessible. Finish: Warming, soft and long, with notes of vanilla and spiced pastry, succeeded by aniseed, polished oak, bittersweet liquorice and a last burst of red berries, which fades to soft spice, sweetness and oak. Nose: A mellow base aroma, soft and sweet, like a buttery pastry case, lightly dusted with nutmeg ready for a custard filling, or perhaps almond oil and oak shavings. Above this, there’s a fruity filling of gently sour apples, spiced pears and ripe melon, orange peel too, before an intense brown sugar sweetness builds. The spicy notes continue to develop, with clove and cinnamon-laced biscuits balanced by candied lemon, more sharp apple and an underlying green herbiness. A drop of water introduces a waxy note and suppresses the fruity elements. Palate: Smooth, sweet and fruity, with a trace of crisp acidity and oak spice to balance the sweetness before it can cloy. The apples and pastry on the nose persist, now caramelized and bitter-sweet, as part of the fruity centre palate. With a splash of water the taste becomes lightly sweeter, while light acidity again steps in to reveal more complexity. The fruit is savoury; light floral notes appear; the oak picks up char; the spice is toasted and fragrant. Finish: Warming, spicy and lingering, with liquorice that fades to stewed, baked and fresh-sliced apples and warming oak that persists in closing, bitter-sweet flavours. Nose: Mild, rich and sweet initially, with vanilla toffee giving way to leafy, green and herbal notes of fennel and fresh cut grass. The sweetness remains, moving through candied nuts to polished oak and sweetened cream. With time, it becomes a fresh-fruity aroma overall, with hints of orchard fruit, dried apple rings and baked apples joined by poached pears in a fruit salad that also features melon, orange, nectarine and banana with a crunch of sweet pastry. Water introduces a cooling, floral note, but the fruitiness remains. 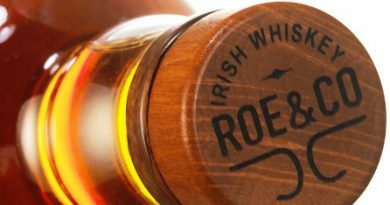 Palate: Smooth and very sweet, A burst of sweetness washes over the palate, with traces of spun honey and honeycomb, followed by sour apples, oaky spice and brown sugar. The fruit stays centre stage, with icing sugar sweetness, butter and wood at the edges. The spice builds, with light cinnamon joined by dark clove and dried orange peel. Water calms the spice to reveal sweet notes of cream, sherbet and almond nuttiness, with orchard fruit and fruit jelly. Finish: Of medium-length, quite dry, with oak and woody spice fading to leave brown sugar and hints of anise. As the anise dies away, dried apples and spice reappear momentarily, before at last revealing sweet oak. Nose: Rich butterscotch leads quickly into pastry and masses of sweet, sugar dusted fruit, with a top note of fruit chews on a base of fruit salad in syrup (including sharp fresh apple and pear, tinned peaches & pineapple, fresh nectarine and banana). This folds into classic vanilla toffee and planed oak as a more savoury and meaty note develops, adding an umami richness, while everything remains fresh and vibrant. A drop of water increases the oak-related scents, and introduces traces of almond oil. Palate: Creamy in texture and lightly sweet, with honey and golden syrup, then buttery, spiced pastry. Some dried fruit is succeeded by a decadent fruit salad of wine gums and boiled sweets balanced by fresh, sweet-sour apples, limes, apricots and unripe mangoes. Spice builds as the fruit fades, with freshly sawn oak and cinnamon. Water isn’t needed, but with it the texture is smooth, the taste sweet, with creamy-sweet vanilla around the fruity core. Finish: Long, warming and oaky; the fruit returns, as apple skin and sweet pear, now tempered by nutmeg-spiced butter and herbal hints, with a lingering last note of peach. Nose: Light yet complex. Peat-reek, damp bark, charred wax, flowers and tropical fruits pursued by familiar chamois leather and sherbet lemon. The fragrance evolves as a new-mown spring meadow, all wild flowers and grass, fading to a darker, savoury earthiness with dry peat and brushwood while the leather picks up spice, all of it wreathed in gentle scented wood smoke. A drop of water makes the aromas really smooth and waxy, raising scented candles and a trace of cinnamon, with noticeable smoke, warm spices, honey, tropical and stone fruits. 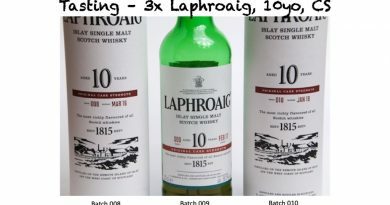 Palate: Fabulously smooth; oily-textured, sweet and fruity. Lemony citrus, then that savoury earthiness, with fragrant damp grass, ripe fruit (spiced peaches) and spicy smoked meats. As with the nose, the earthy notes build, mixing in dark chocolate, scented wood smoke and burnt orange, before a sweeter and lighter note of freshly sliced apple, spiced and sweetened, livens things up. A drop of water lowers the spicy heat, leaving orchard fruit, slightly charred, and softly sweeter, with a little sweet mint. Finish: Smooth, warming and spicy, with aromatic smoke. Digestive biscuits, crisp green grapes and lingering notes of earth, damp leaf and charred oak. Water enhances all this, and there’s a fine smoky-waxy after-taste. Nose: Approachable and gently drying. At first citrus-fruity and fragrant; pears in syrup, lychees, mandarins and lemon sherbet, with honeysuckle and perfumed oak. Behind this there’s a spicier edge, with notes of cinnamon and nutmeg then toffee apples, green grass or moss and pastry, with a late suggestion of almonds. After a few minutes, sweet notes dominate, with candy, vanilla toffee and creamy fudge balanced by a softly spicy background. Adding a little water brings up more soft fudge. Palate: Unctuous and sweet, suggesting a fondant cream with a spicy edge. An initial burst of citrus is swept away by candied sweetness and a prickle of spice, before lemon cake, digestive biscuits and spiced porridge roll in. Notes of sharper oak then fade to reveal hints of wine gum and lemon zest. Water softens the candy sweetness; revealing more leafy notes, sweet and creamy toffee, and more orchard fruit; sweet apple and ripe pear. Finish: Lengthy and warming with spicy oak-wood, a pinch of white pepper, lingering candied sweetness. Nose: Surprisingly mild in feel. The overall aroma is tightly integrated: spicy-sweet and fruity, combining spiky green leaves and dog roses with autumnal forests, toffee and rich vanilla sauce. The greenness comes to dominate, although the sour notes are tempered by sweet brown butter and a slice of candied fruit. Time reveals more herbal notes, with minty toffee and hints of pastry. 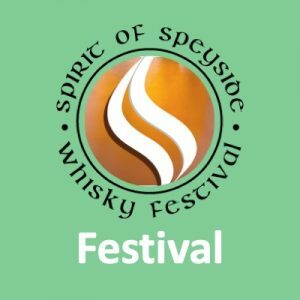 Water opens all this up, drying and introducing Speyside notes of the sweetshop, with candy and dried apple rings joined by floral touches. Palate: A balance of sweetness, acidity and tannic dryness. Nuts and spice lead, with hazelnuts and almonds joined by bitter walnuts and hot cinnamon. Sweetness builds behind, with candy, barley sugar and sharp candied lemons. The almonds reappears, now sugared, only to disappear amid more citrus, tempered by toffee and fudge spiced with cinnamon, and finally by fruity dark chocolate. Water cools; the smooth sweetness and spice rise, bringing a refreshing bitter note; cream, apple sauce and milk chocolate laced with oak, clove and dark chocolate. Finish: Of medium-length, with buttery pastry, warming spice and a thin layer of sharp fruit; a fresh apple pie ready for the oven. The fruit lingers as apple skin, joined by crisp pear. Danke Thomas für die Proben!